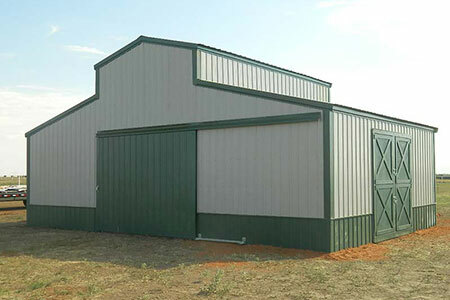 Do you need a barn, workshop, or garage constructed on your Oklahoma City area property? D Cross Barn Co. has over 20 years of experience in the post frame business, and we specialize in building barns in the Oklahoma City region! D Cross Barn Co. has experience constructing a wide variety of barns and buildings, so we can accommodate your needs and desires. Most of our barns are post frame buildings. Post frame buildings are wood frame structures with posts for piers which allow you to build on unlevel ground. This means we can construct your barn where you need it most! These buildings are sturdy, long lasting and enable you to design them to fit your needs. We also make them visually appealing, so they will add to, not take away from, the beauty of your landscape! If you need a building constructed on your property and it’s not a standard design or layout, that’s not a problem for us! Let us sit down with you and hear your ideas, and together we can come up with the perfect building for you! You can even add custom features to your barn. Maybe you’d like skylights or windows, or insulation or soffited overhangs. You tell us what you want for your building, and we can make it happen for you! D Cross Barn Co. is a leading pole barn builder in Oklahoma and in the surrounding states, and we would love to construct the barn you need for your property! Contact us today at 1-866-749-7627 or 918-805-7512 for a free, no-obligation consultation or quote!